Simwave’s applied research team recently carried out a real-time simulation study for The Concordia Group regarding the berthing and unberthing of a bulk carrier. 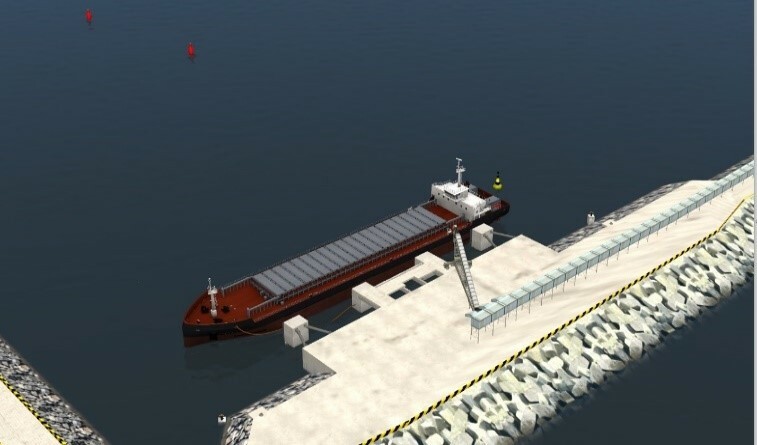 The main objective of the research is to develop a new model of a specific bulk carrier, and 3D visual database of the port and jetty near Conakry for evaluating the ship’s manoeuvring ability in this port. Because the ship is under design by Concordia, The Netherlands, and the port is under development, it is required to have a feasibility study prior to construction and safe manoeuvring of the vessel. Based on necessary information, the berthing area of the port and its infrastructure, which include the approach area, jetties, water depth contours, were developed as realistic and accurate as possible. The port fairway, berths and jetties were included in the simulation with an accurate reproduction of the breakwaters and breakwaters slope and permeability for both the visual and hydrodynamic effects. At the same time, the ship visual and mathematical model were created with detailed characteristics consisting of hydrodynamics, hydrostatic effects for shallow water, banking, ship-to-ship interaction, current, wind, wave. A mechanical system was developed for mooring and anchoring activities. In the second step, specific scenarios of the arrival and departure from the jetties were simulated for handling including berthing and unberthing with prevailing environmental conditions which cover water depths, tidal data, wind forces and directions, current set and drift and wave pattern. The study outcome produced prerequisites and solutions for handling the ship at the port in specific loading status and in different environmental situations which were set up according to the practical conditions of the designed port. The study also determined the allowable draft for safe passage through the fairway and navigational area. The study outcome also gave answers to the questions in relation to the necessary immersions of the propellers for ensuring a proper performance of the propulsion system. Our applied research team carry out different studies at the moment and we offer a full package to clients including shiphandling courses, Bridge Resource Management (BRM), Engine Room Management (ERM) and bespoke training for clients. For further questions feel free to contact our customer service team.